It is almost a decade and half since Amir Khan won the British nation’s hearts and the Olympic lightweight silver medal in Athens as a bright-eyed 17-year-old who was Britain’s lone ring representative, losing only in the final to the Cuban maestro Mario Kindelan, then the world’s finest amateur. Since then he has won, defended and subsequently lost the professional light-welter world titles and established himself as a pillar of Britain’s Muslim sporting community. Subsequently the quicksilver medallist became the Golden Boy, winning the world light-welterweight title in 2009 and moving to America before losing it two years later to Lamont Peterson after five successful defences. Those years were always a fascinating roller-coaster ride featuring a brilliant but brittle boxer whose unbounded bravery could too often become his nemesis. Khan’s chin may have been questioned but never his courage in the ring or commitment to noble causes. I have known and liked him since his schoolboy amateur days, watching him become a shining beacon for racial harmony and community relations. I also attended his wedding reception after his marriage to American Faryal Makhdoom. I like to think he is a friend. But I confess serious concern for him now. On Saturday, in the boxing Mecca that is Madison Square Garden in New York, he comes fist to face with one of the most formidable figures in world boxing, challenging Terence ‘Bud’ Crawford, the freshly-established World Boxing Organisation (WBO) welterweight champion. It is an lucrative engagement, but one liberally spiced with danger. Equally as dangerous, in fact, as that just under three years ago when he was knocked sparko in five rounds after putting up a typically bravura performance for four of them against the World Boxing Council (WBC) middleweight champion Saul ‘Canelo’ Alvarez. So Khan steps out of the Mexican’s frying pan into the firing line of another of the world’s great pound-for-pounders. For the unbeaten American (36-0) from Ohama is right up there with Canelo, Vasilly Lomachenko, Olexsandra Usyk and Gennady Golovkin as the supreme bunch of five in boxing today. No doubt the boy wonder from Bolton, now a fistically mature 32-year-old was rubbing his chin-reflectively rather than prophetically we hope – as he observed his fellow Lancastrian Anthony Crolla ruthlessly dismantled by the sublime skills and finishing power of ex-Olympic superstar Lomachenko in Las Vegas last Saturday night. It was as painful to watch as it was for Crolla to feel; a shameful mismatch in which the Ukrainian world lightweight champion was quoted 100-1 on by the bookies. The odds against Khan causing a seismic upset are a mere 10-1. But it is seems similarly long shot. While 31-year-old Crawford does not have the same absolute punching strength as Loma or Canelo, he is capable of delivering hurtful, damaging blows from all angles. Khan, with four defeats (three by clean ko) in his 37 bouts, has fought only twice since despatched to hospital by Alvarez in May 2016, last year stopping a nondescript Canadian, Phil Le Greco in Liverpool, and getting up off the floor to outpoint Colombian journeyman Sammy Vargas in Birmingham. If he is to have any chance if dethroning Crawford he must recapture the blistering hand speed of his earlier days, keep his chin down and his wits about him. He knows he is at the crossroads of his 14-year career. Another defeat world see him turning into a cul-de-sac. “I have been fighting for many years and I need this kind of contest to lift me,” he told The Guardian.” It’s a fight to keep me in the sport, to give me the love for it. 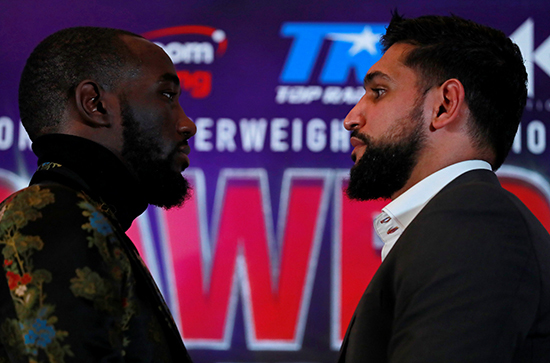 His hope is that while the former multi-belted world super-lightweight champion Crawford’s unblemished record includes some respectable opponents, there is not one outstanding rival, particularly at his new welterweight poundage. Khan, who has been through more trainers than Mo Farah’s feet, has reverted to San Francisco-based coach Virgil Hunter, who has recovered from illness and who will demand that he concentrates on his natural speed and elusiveness. But Khan’s default position has always been that he wears his heart on his chin. Against Alvarez he unwisely, but profitably (pocketing some $6million) moved up middleweight, two divisions above his natural poundage, but boxed well for four rounds before, in the fifth, the Mexican’s pulverising right hand knocked him out instantly. It left him lying utterly still on the canvas and he had to be taken by ambulance to hospital. It should be a good fight to watch – while it lasts. I see Amir dazzling and dancing for five or six rounds before the patiently stalking Crawford catches up and starts clouting him. If and when the predictable end comes I hope the referee will be merciful because I would much rather see my friend Amir go out on his shield like a true warrior, than be carried out on a stretcher.